Quince is one of the final fruits available in my area for fall harvesting; they ripen throughout October and November in the Northern hemisphere. If you have a quince tree in your yard, lucky you! If you don't, ask around or go foraging. If nothing comes up for you either way, plant a quince tree. This fruit is taking off in renewed popularity, but most quince found in specialty groceries are imported from Argentina. We don't need to waste precious fuel to import these fruits; while I'm happy that quince is making a slow comeback, since they grow well in much of the United States (zones 5-9), I'd love to see them dotting the landscape for harvesting instead of becoming a quaint, sought-after import. 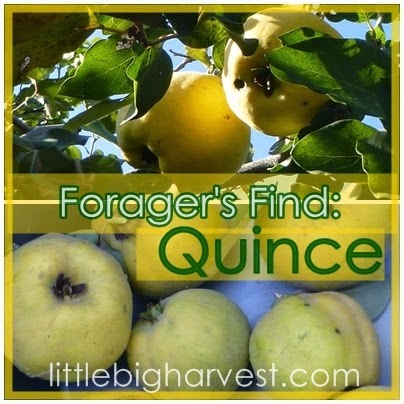 When I set out to write about quince, I hesitated at first to consider it a 'forager's find'. Quince used to be an everyday affair; many people had a quince tree in the backyard just as they had a mulberry tree or three. Now, however, the quince fruit mostly goes unrecognized. Even those who are lucky enough to have a quince tree in their backyard may not know what it is, and perhaps have only gone as far to nibble the strange fruit (which is practically inedible raw) and decided it wasn't useful to them. Researching quince will take you in all kinds of directions; not only for its interesting history, but also for its current state of affairs. Numbers are going down due to fireblight, which quince are susceptible to (but that you can take steps to avoid and control), and also due to people cutting them down because of their sometimes unruly appearance. I read one man's account online with sadness--he was annoyed by the appearance of his neighbor's quince and wanted it done away with. With simple pruning and care, the quince can stay healthy and beautiful, while providing you with fruit! It's safe to say that although a certain number of people are crazy about quince (*raises hand), it's slow and subtle fade from the collective knowledge of seasonal food has made it a misunderstood beauty. Ultimately, I decided that even though quince was once common, it is definitely now a forager's find. It's not only a forager's find, it's a foragers treasure, due to the increasing difficulty in finding it. Put on your forager's hat and take some long walks, subtly and innocently peering into backyards as you go along. Or, post a 'wanted' ad on your local freecycle, stating "Wanted: Quince from your quince tree. I'll pick it, you get jam out of the deal." Hey, why not? If you are out looking, keep your eyes peeled for a compact shrub or tree with bright yellow, round fruits. The fruit is usually bunched up together in groups. The tree won't likely be taller than 20 feet, and it may be a bit gnarled looking; as quince trees age they take on an interesting twisted appearance. This is the tree I harvest from. to show its twisted and gnarly trunk and branches. It's more of a shrub than a tree, at about 15 feet high. I am very fortunate; there is a quince tree at my childhood home that has survived decades and continues to thrive. It may well be older than me, in fact. Though my grandma made quince jam, I never really took a lot of interest in the quince until recently, and then "bam", lucky for me, the tree still lives, ready for me to love. I've fallen so hard for quince that I'm scanning my yard for the perfect place to plant my own. I can't believe how much such a small tree produces, and I find its twisty appearance very beautiful. Once you fall in love with quince, you might spread the word loudly enough to convince more people to plant a tree in their yard, and give quince its rightful place in our seasonal diet once again! Listen, this fruit goes way, way back. Quince may be making a recent comeback in the United States, but it's been around a very long time. In fact, some people have suggested that quince itself was the forbidden fruit referred to in the bible; after all, quince predated apple culture. Quince is mentioned in ancient Greek and Roman history repeatedly. It was a ritual offering at Greek weddings, because of its tie to Aphrodite; more than likely the 'golden apples' given to her by Paris of Troy were quince. The colonists in America planted quince trees as part of their homesteads, Thomas Jefferson had several trees on his estate--yet even with its strong history, and despite the fact that quince trees still grow all over the northern U.S., the significance and importance of the fruit has been largely lost. We may have forgotten quince, but the much of the world has not. Quince is still very common and used extensively in the Middle East, Spain and Africa; varied locations who all value its unique flavor. Can't find it while foraging? PLANT a quince tree! If your foraging turns up nothing, consider planting a tree of your own. Encourage your parks department to plant some in public spaces. There are several varieties of quince, and some of them are purely ornamental, so you'll want to be sure you are choosing a fruiting variety. Eaten along with its cousins in the Rosaceae family--cousins the likes of apples, pears, apricots and plums-- quince can help us maintain plant and food biodiversity. This is worth a mention, too; the blossoms of this tree are just incredibly beautiful--some people find value for the quince solely for its beautiful spring blooms. Quince is amazing; Check this Out! 1. It's good for you--High in fiber, antioxidants, and vitamin C. We can never get too many antioxidants in our bodies to fight the toxins that bombard us from the environment, and vitamin C helps us in many well-documented ways. Quince has more vitamin C than those celebrated oranges and grapefruits. Vitamin C is not the only good thing going for quince, though; according to the fantastic book Healing Foods , quince helps increase blood circulation to the muscles and tendons. It is used in the treatment of rheumatic pain and cramp in calf muscles, and also to treat spleen ailments. Though I haven't experimented beyond jam, there are countless ways that this fruit is prepared around the world: baked, roasted and served with meats, made into wine, pickles, liqueurs, tea, and there is a wonderful thing called membrillo that I am just dying to try. In some cultures, quince is made into pastes and tinctures to be used medicinally for a variety of afflictions including rashes, intestinal discomfort, and even pneumonia. 2. It's high in pectin and naturally forms jelly and jam without having to add anything but sugar and water. It can be used as a gelling agent in other lower-pectin fruit jams without changing the flavor, and in fact may be even better than using apples in pectin-free recipes. Its high pectin content was one of the reasons our great-grandmas insisted on having a quince tree in the yard; before the advent of commercial pectin, there was no better way to make jellies and jams than to include quince. 3. It smells absolutely amazing! Leaving a bowl of quince out on the table will scent the entire room. Once you pick some of this unique fruit you just can't seem to stop putting one up to your face and inhaling deeply. It's difficult to find the exact words to describe it, but when I inhale deeply the fuzzy skin of the quince I think of a mix of lush roses and juicy pineapples (that pineapple scent I picked up may be due to its variety; after researching, I'm almost certain the variety I harvest is called pineapple quince). Despite the lovely and fresh scent, you really don't want to bite into a quince fruit. Most varieties (this one being the exception) are difficult to eat until you've cooked the fruit. 4. It will enhance your favorite apple preparations. I have heard that adding a diced quince to your batch of homemade applesauce will give it a wonderfully unique flavor. Some people add a bit of quince to their apple pies. The strong floral scent adds a little something special to apple dishes. 5. It brings back memories. Okay, maybe this reason is personal. Quince has been in our family since before I was born, and I bet many people have grandparents who ate it, even if they don't remember. The strongest memory I have of quince up to this point is the way my grandpa asked for it at the end of his life. I have a very specific incident, a moment that will always be clear and treasured in my mind; my Aunt Jeanne feeding Grandpa quince jam on a spoon, right from the jar. He had been bed-ridden for quite some time, and had gotten to the point of not feeding himself. Quince was what he wanted, what he craved, and it has only hit me in recent years, after picking quince from the same tree Grandpa picked from, how this simple fruit has a compelling connection to my life. As the sunlight shone through the branches on the tree and I reached for the yellow globes above me, I felt a moment of transport, a sudden breath in my hair from someone leaning over me, the invisible afterglow of someone enjoying this harvest long before I did. Grandpa was there, picking quince with me. Please look for some quince for yourself, or consider planting a tree. It's making a comeback, and it is actually a pretty amazing little fruit. A simple preparation for quince is jam: CLICK HERE for my quince jam recipe! Happy Foraging...Go Find Some Quince!